If AMC’s Mad Men has taught me anything, it’s that it is all about the right suit for the right time. Whether your uniform is set for a boardroom, athletic field, moon adventure, or a few expedited laps around the track, the right set of threads is essential. With the introduction of the new Alpinestars GP Tech Suit, an era of lightweight, comfortable, and super comfy suits is at the door. This suit’s .8-1.0 kangaroo/cowhide construction is specifically designed to be as lightweight and mobile as possible. With that in mind, they have been able to shave almost three pounds off of previous suit constructions and also allow for a better range of motion while on the bike. This suit has all of the bells and whistles that would be expected, from CE armor in the shoulders/elbows/knees/tibias, to chest pad compartments for the Bionic Chest Plates, and a multi-snap system to integrate the CE2 Bionic Back Protector. It also comes with external PU sliders, 3D mesh removable internal liner, and textured inner knee area for better grip on the tank of the bike. At the same time, the outer shell has been specifically designed with minimal dressings, so that it can better accommodate team/sponsor logos. The right suit is more than just the fabric and design, it is a mindset. When you dress up, suit up, and gear up to go to work, the correct option for the job can do wonders to get you focused on the tasks at hand so that you can handle yo’ biz-nassss! 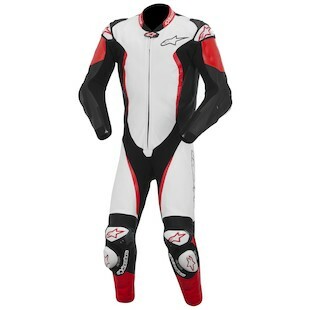 With that in mind, the Alpinestars GP Tech Leather Suit is an apex option for the most ardent of motorcyclists.